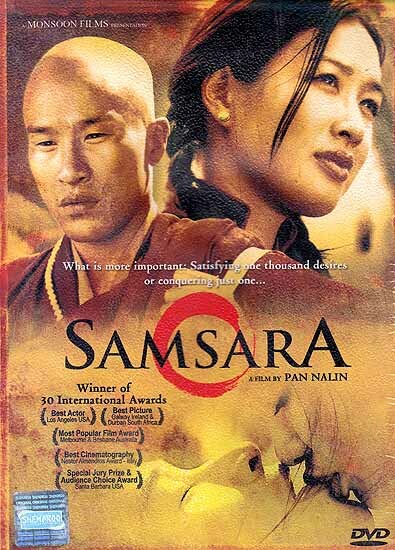 Samsara (which means “the world”) is an epic of spiritual and sensual romance set in the majestic landscape of Ladakh in the Himalayas. Tashi, a Buddhist monk who emerges from three years of solitary meditation returns to his monastery where he is revered for his discipleship. On Tashi’s return and despite a life devoted to the rigours of spiritual development, he finds himself experiencing a profound sexual awakening and a strong attraction to a beautiful woman Pema. When faced with this unexpected awakening of his human desires, he questions the spiritual values of his monastic existence. And decides to opt out of the monastery for the secular world.